The tuners over at Hennessey Performance have always had a thing for boosting anything that rides on four wheels. 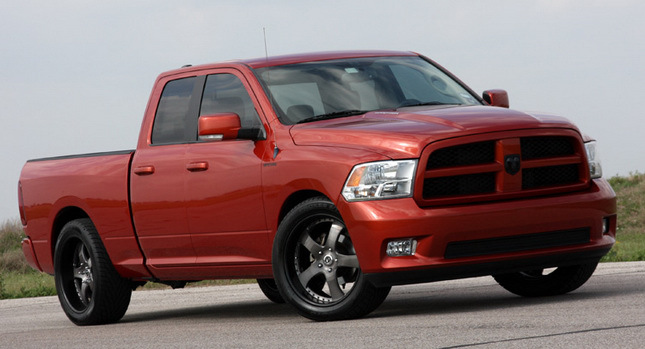 More recently, the Texas-based tuning firm applied its technical wizardry on the Ram Truck. The result is the Hennessey HPE500 Supercharged Ram, which as implied by its name, features a supercharged version of the Chrysler Group’s 5.7-liter Hemi V8 producing 505-horsepower at 5,400 rpm. The tune include numerous standard upgrades such as a sport exhaust and Hennessey embroidered seats, along with various optional parts like different alloy wheel and tire combos and suspension systems. While we’re waiting for Hennessey to pit the HPE500 Supercharged Ram against a stock Nissan GT-R or a Porsche 911 Turbo, you can watch the powerful pickup truck in some tire shredding action in the video after the break.